Access to the internet in today s classrooms has opened the door to a variety of new pedagogies that enhance learning in the geosciences while being easily adopted with minimal investment. Web-based virtual tours, explorable gigapixel panoramas, GIS and Google Fusion Tables allow users access to a wealth of information for conducting in-depth investigations and analyses of locations that are impractical to visit due to time or budgetary constraints. Several of these emerging techniques have been combined to bring field investigations of battlefield terrain into the classroom through virtual fieldwork. The Battle of Gettysburg, the largest ever fought in North America, was significantly influenced by the topography and geology of the farmland surrounding the small Pennsylvania town. 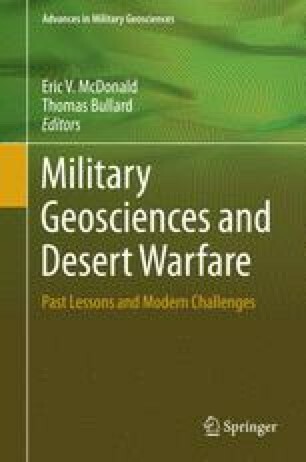 This makes the battlefield an excellent venue for teaching the impacts of geology and landscapes on military operations. Several Gettysburg-based projects have been developed to introduce concepts of military geoscience to students and the public and integrate virtual fieldwork into the classroom. One virtual tour of the battlefield (https://sites.google.com/site/gettysburggeologyfieldguide/home) utilizes a traditional webpage platform to explore the effects of geology and topography on the fighting, while another (https://sites.google.com/site/gettysburgvirtualfieldwork/home) uses the unique interactive environment of Google Earth, with traverses, annotations, and immersive high-resolution panoramas that give the user a soldier’s-eye view of the terrain. In-depth investigations of the battlefield can be conducted in the classroom with rock samples (both physical samples and 3D scans), topographic maps, explorable gigapixel petromicrographs, and geolocated GigaPan panoramas of the battlefield (www.gigapan.com). Students are provided samples representing the prominent rocks of the Gettysburg area and topographic maps with marked field stops. They orient themselves using Google Earth, make field observations (including locations of outcrops, weathering patterns of rocks, and topography), and identify rocks in outcrop. After compiling their data and creating a geologic map, they investigate how geology and topography affected the strategies of the Union and Confederate armies and the heavy casualties suffered by both sides. By creating interactive environments, these new tools promote learning through experience and exploration rather than memorization. Below are a few tips to get you started creating your own virtual field experiences as described above. The GigaPan robotic camera system is available for purchase at www.gigapan.com. Stitching software is included. Authors of GigaPan panoramas are able to upload their pans, geolocate them in Google Earth and embed them in webpages using tools available on the GigaPan website. Visitors to the GigaPan website are able to create snapshots in any panoramas and embed selected panoramas into webpages. We set up several webpages to disseminate information for this project. Depending on your skill level, there are many options for creating your own webpage. We used Google Sites (https://www.sites.google.com/) which provides a free, easy-to-use platform for adding text and images to your webpage. It also allows users to directly edit the page’s HTML code. Google Earth provides much more functionality for creating virtual field experiences than can be discussed here. Those who wish to explore virtual field experiences further should start with “An Illustrated Guide to Creating Virtual Field Trips Using Google Services” (ATEEC 2007). To create a virtual field environment in Google Earth, first download the latest version of the free software (http://www.google.com/earth/index.html). If you are not already familiar with navigating in the Google Earth environment, take a few minutes to familiarize yourself with the controls by working through the product tutorials available on the website. Click on the “Add” menu at the top of the Google Earth window to add a folder. Give this folder a project name—all your project materials will be housed inside this folder. Once it is added, you will see the folder in your “Places” panel. Be sure that your new folder is inside the “My Places” folder and not inside the “Temporary” folder—simply drag and drop to rearrange the folders. Once you have found a feature you would like to mark with a placemark, click on the yellow tack icon at the top of the window (or Add → Placemark) to add a placemark to your folder. Position the placemark (by dragging the yellow box) so that it is centered over the feature you are marking. In the “New Placemark” window, you can name the placemark, type a description of the feature you are marking, insert a link, or add HTML content. If you already have content on a webpage that you would like to add as an annotation to the placemark, simply copy the HTML code from the part of the webpage you would like to use and paste it into the “Description” tab in the “New Placemark” window. The content you have added will appear when users click on the placemark. Clicking on the yellow tack in the upper right corner of the “New Placemark” window will allow you to choose a new icon for your placemark. To finish your placemark, click OK. Note that your new placemark has appeared inside your folder in the “Places” panel. If not, drag and drop until it does. To add an image overlay to your project (useful for projecting geologic maps or battle maps onto the terrain) click the “Image Overlay” button at the top of the window (or Add → Image Overlay). The image overlay can be scaled by dragging the green edges of the image. Transparency is controlled by a slider in the “Image Overlay” window. Location and rotation of the overlay are controlled in the “Location” tab in the “Image Overlay” window. The panel on the left side of the window allows you to turn placemarks and other layers on and off by checking or unchecking the boxes.